Fixing up your skin setbacks, respiratory ailments and mental mayhems is just a few steps away, until you reach the sacred aroma of Benzoin essential oil. Blessed with a divine fragrance and handful of healing values, Benzoin has been in use since thousands of years as a holy aromatic agent in temples and other religious ceremonies. Being a pacifying agent, Benzoin and its essential oil is said to have been used for soothing depression and treat skin disorders. Scientifically known as Styrax benzoin, it is also called as gum Benjamin or gum benzoin. Used as a natural aid to heighten spiritual oneness and divinity, Benzoin resin was burnt by the ancient saints, Hindu priests and Buddhist monks during prayers and holy congregations. It was used in various Complementary and Alternative Medicinal systems including Ayurveda, in the treatment of depression, wrinkles, congestion, sinusitis, bronchitis, tonsillitis, cough, flatulence, urinary tract infections, premenstrual syndrome, inflamed skin and impotence. Chemical constituents and therapeutic properties of Benzoin resin oil: The key chemical components of Benzoin resin essential oil are benzoic acid, coniferyl benzoate, phenylpropylic alcohol, benzaldehyde, cinnamic acid, benzyl benzoate, vanillin and phenylethylene. 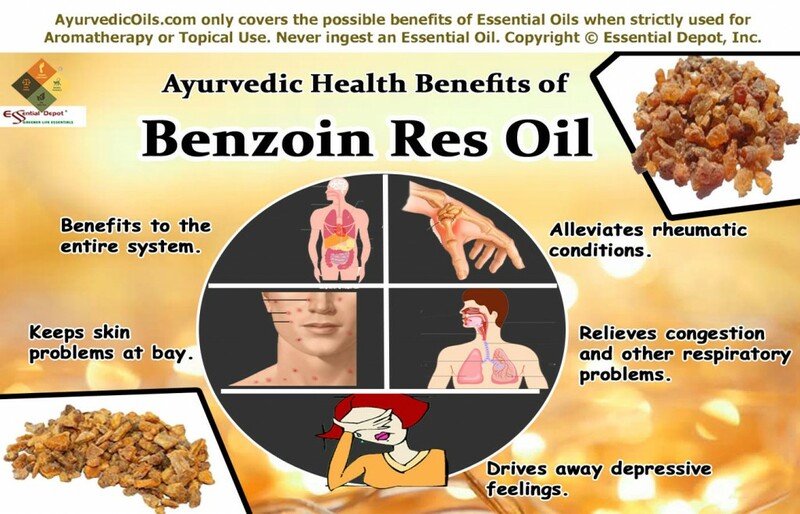 Ayurvedic health benefits of Benzoin resin oil: Ayurveda embraces nature wholly and it is reflected in every single remedy it prescribes to mankind. This is the most valued attribute that has helped Ayurvedic healing survive and stay in the hearts of many across the globe. With the immaculate meaning of ‘knowledge of life’, Ayur+Veda is the only healing system on earth that insists on self-awareness about one’s own health condition and individual constitution. This traditional wisdom of healing brings in that wakefulness, where an individual understands that every human being is being created with all kinds of mental and physical abilities in a clear order. Ayurveda helps in appreciating this uniqueness and leading a hale and hearty life in sync with nature, which is built with five fundamental elements. They are earth, water, air, space and fire. Everything on earth including the human body is made with these five elements, where the earth takes the form of muscles and bones, water represents blood, fire helps in the biological functions including metabolism, space is the soul that keeps us alive and air assists in breathing. According to Ayurveda, every human being is a unique part of nature with a unique individual constitution. This constitution is known as Prakriti and is a combination of three biological elements called as doshas. They are vata, pitta and kapha. Every person has a predominance of any one of these doshas and it determines the traits, character and behavioral attributes of a person. Ayurvedic remedies are based on the predominance of the doshas and the balance between them. Absolute health in Ayurveda is a sign of perfect balance between these doshas and illness indicates doshic imbalances. Ayurvedic healing techniques and medications aim at correcting the disparities between the doshas. The major natural remedies prescribed in Ayurveda are herbs, plant essential oils, meditation, yoga, simple physical exercises, Ayurvedic routine, prayers and few other Ayurvedic techniques like Panchakarma or Ayurvedic detox, Abhyanga or Ayurvedic massage and Pranayama or Ayurvedic art of balanced breathing. Benzoin resin oil has moisturizing and warming energies, which helps in tranquilizing the mind and enriching the skin. This oil has the power to pacify vata, pitta and kapha dosha with its sweet-balsamic, pleasant and vanillin based aroma. Benzoin essential oil has anti-rheumatic, anti-arthritic, anti-inflammatory and diuretic properties that help in promoting proper blood circulation, reducing pain, lessening inflammation, controlling soreness and swelling, and eliminating the surplus water deposits and toxic elements in the system by promoting frequent urination. This function also assists in treating obesity, controlling blood pressure, supporting the functions of the circulatory system and enhancing metabolism. To get rid of rheumatic and arthritic problems, Ayurveda suggests a healthy diet that naturally controls kapha vitiation along with yogasanas that treat rheumatism and arthritis and the use of Ayurvedic essential oils like Benzoin resin oil. Along with this, massage the painful parts with 3 drops of Benzoin resin oil mixed with 1 drop of Ginger oil, 1 drop of Lavender oil, 1 drop of Black pepper oil, 1 drop of Juniper berry oil with 4 ml of coconut oil. You can also add 2 drops of Benzoin resin oil and 2 drops of Marjoram oil in warm bathing water or in hot compress for improved results. This formula works quickly as the benzyl components in the Benzoin oil are easily absorbed by the pores of the skin. 2. Relieves congestion and other respiratory problems: Breathing is the natural action that sustains life. Trouble-free breathing brings in enormous health and happiness by permitting the flow of prana or vital life force in the system. Any interruption or blockage in the breathing mechanism due to improper food habits, environmental factors, stagnation of water deposits and toxic substances in the system leading to built up of mucus and phlegm deposits (this is a kapha imbalance) cause respiratory problems. Benzoin resin essential oil has the power to reduce excess kapha dosha, with its expectorant properties. 1 drop of Benzoin oil with 1 drop of Eucalyptus oil and 1 drop of Niaouli oil in steam inhalation aids in loosening the accumulated phlegm and mucus, relieving congestion and cleansing the breathing passages. Gently massaging your chest, throat and back with your vaporizing ointment mixed with 2 drops of Benzoin oil and 2 drops of Frankincense oil, following the steam inhalation can aid in relieving cough, cold, congestion, bronchitis, laryngitis, blocked nose, asthma and other respiratory allergies. You can practice breathing exercises like Pranayama and yoga asanas for respiratory illnesses. 3. Drives away depressive feelings: Benzoin resin oil has a gentle, sweet and soothing aroma that tranquilizes the mind with its relaxant, sedative and anti-depressant properties. When inhaled, these remedial properties in the aromatic molecules of this oil pass on to the brain through the nasal passages. This has a positive effect on the limbic system, which is the control center of the brain. 2 drops of Benzoin resin oil along with 1 drop of Ylang Ylang oil and 1 drop of Orange oil added to your vaporizer, burner or diffuser can assist in stimulating the central nervous system, pacifying the mind, granting mental clarity, controlling anger, treating anxiety, improving blood circulation and instilling the power to control depressive feelings. According to Ayurveda, among the 7 chakras, Benzoin resin oil affects the root chakra and the solar plexus chakra. Root chakra or sacral chakra is responsible for survival factors like security issues, financial independence and the ability to stand up high. Imbalance of this chakra leads to depression and various other nervous problems. Solar plexus chakra deals with self-confidence, self-esteem, self-control, self-worth and other personal powers. The failure of the functions of this chakra leads to nervousness, lower self-confidence, inferiority complex, poor memory and digestive disorders. Benzoin resin oil, with its power to treat the imbalances of the root chakra and solar plexus chakra, brings in self-confidence, trust and the ability to stand tall to beat depression and other negative feelings. While talking on the relaxing effects of Benzoin resin oil on the emotional aspects of the system, Madame Maury says, ‘this essence creates a kind of euphoria; it interposes a padded zone between us and events’. You can also work out these Yoga asanas for depression and practice meditation. Benzoin resin oil has everything in its kitty for dealing with various skin problems ranging from wounds to treatment of scars. The healing properties are mainly due its chemical components including benzyl benzoate, benzoic acid and benzaldehyde. This oil is a natural antiseptic with germicidal, disinfectant, antiviral, antibacterial, antifungal and vulnerary properties that aid in healing wounds, cuts, sores, acne, chapped skin, eczema, scars, skin irritation, psoriasis and dermatitis. Applying the mix of 2 drops of Benzoin resin oil with 1 drop of Lavender oil, 1 drop of Rose oil, 1 drop of Lemon oil, 1 drop of Bergamot oil, 1 drop of Frankincense oil and 4 ml of Sweet almond oil on pimples, wounds, cuts, sores, scars and other infectious skin problems can help in protecting the infected parts from germs and promote quicker healing. Massaging this blend on your skin especially on dry, cracked, blistered or chapped skin helps repair and rejuvenate the skin cells especially on the elbows, knees and heels. It also helps in maintaining the skin suppleness and softness. Ayurveda recommends drinking ample water every day to retain healthy skin cells. 5. Benefits to the entire system: Apart from these magnificent benefits, the essential oil of Benzoin can bring in enormous other benefits to your complete system. They are the promising effects of this oil that can help in destroying germs in the mouth with its disinfectant properties and tightening the gums with its astringent properties. It also aids in treating digestive disorders with its anti-flatulent and carminative properties. It can serve as an excellent deodorant with its mesmerizing aroma, for your body as well as your home. Other uses: Benzoin is known for its fixative and preservative values and is used in the perfume industry for these reasons, especially for reducing the dispersal of fragrance elements and essential oils in air. This oil is also utilized as a flavoring agent in baked goods, gelatins, candies, gums, puddings, frozen dairy and beverages including alcoholic and non-alcoholic drinks. Apart from this, its use in the manufacturing of scented candles, cosmetics and veterinary medications makes it a much prized natural alternative since ages. Disclaimer: This information is only for the purpose of education and is not intended for diagnosis or prevention of any illnesses. Do not substitute these remedies for any prescription drugs or expert medical advice. We are not medical professionals and this article is shared with the interest of throwing light on the world’s oldest healing system, Ayurveda. Never use essential oils for internal purposes and make certain that you dilute essential oils in appropriate carrier oils before using it topically. This is mainly because pure and organic essential oils are extremely concentrated liquids and may cause allergic reactions, when used on the skin directly. Talk with your Ayurvedic professional prior to selecting the right essential oils for your Prakriti or unique individual constitution and state of health. Care should be taken before using essential oils, if you are pregnant or a nursing mom. This entry was posted in Essential Oils - Learn About and Purchase and tagged Ayurvedic oils for arthritis, Ayurvedic oils for bronchitis, Ayurvedic oils for common cold, Ayurvedic oils for depression, Ayurvedic oils for digestive disorders, Ayurvedic oils for respiratory illnesses, Ayurvedic oils for rheumatism, ayurvedic oils for scar treatment, Ayurvedic oils for skin health, Ayurvedic oils for skin problems, Ayurvedic remedies for depression, Ayurvedic uses of Benzoin oil, Benzoin in Ayurveda, Essential oils for Chakras, Health benefits of Benzoin resin oil, Styrax benzoin, Yoga for depression, Yoga for respiratory illnesses, yoga for rheumatoid arthritis by AyurvedicOils. Bookmark the permalink.